What Is Peripheral Component Interconnect (PCI)? A technology journalist and freelance writer. Peripheral Component Interconnect (PCI) is a term used to describe a common connection interface for attaching computer peripherals to a PC's motherboard. PCI was popular between 1995 and 2005, and was most often used to connect sound cards and network cards. PCI was also used to connect video cards to the motherboard, but graphics demand from gaming made it inadequate for that use. Modern computers mainly use other interface technologies like USB or PCI Express (PCIe). Some desktop computers might have PCI slots on the motherboard in order to maintain backward compatibility, but the devices that used to be attached as PCI expansion cards are now either integrated onto motherboards or attached by other connectors like PCIe. PCI is also an abbreviation for other technical terms that have nothing to do with Peripheral Component Interconnect, like protocol capability indicator, program-controlled interrupt, Palm Computing, panel call indicator, personal computer interface, and more. PCI is also called a PCI bus; a bus is a term for a path between the components of a computer. You might also see this term described as Conventional PCI. However, don't confuse PCI with PCI compliance, which means payment card industry compliance, or PCI DSS, which means payment card industry data security standard. A PCI bus lets you change different peripherals that are attached to the computer system, so it allows the use of different sound cards and hard drives. 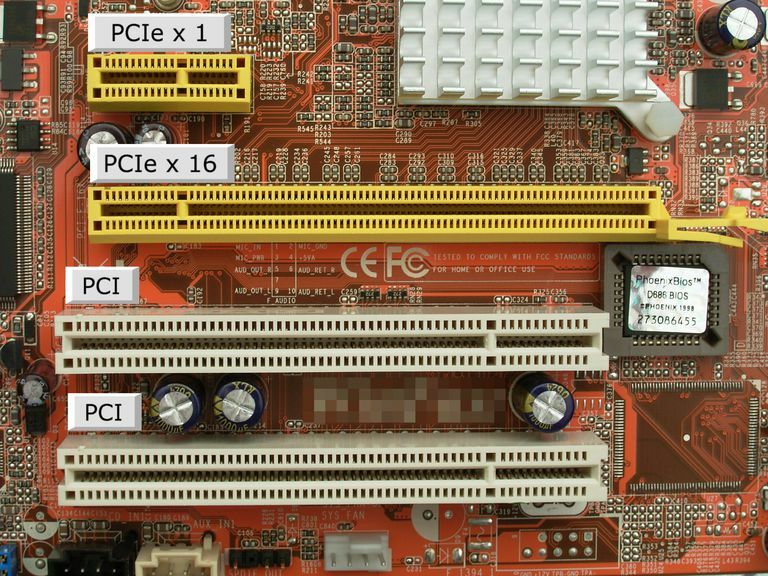 Usually, there are three or four PCI slots on a motherboard. With PCI, you can unplug the component you want to swap and plug in the new one in the PCI slot. Or, if you have an open slot, you can add another peripheral like a second hard drive to dual boot your computer, or a special sound card if you deal with music a lot. Computers might have more than one type of bus handling different traffic types. The PCI bus used to come in both 32-bit and 64-bit versions. PCI runs at 33 MHz or 66 MHz. PCI cards exist in several shapes and sizes called form factors. Full-size PCI cards are 312 millimeters long. Short cards range from 119 to 167 millimeters to fit into smaller slots. There are further variations, too, such as compact PCI, Mini PCI, Low-Profile PCI, and others. PCI cards use 47 pins to connect, and PCI supports devices that use 5 volts or 3.3 volts. The original bus that allowed expansion cards was the ISA bus invented in 1982 for the original IBM PC, and which was in use for decades. Intel developed the PCI bus in the early 1990s. It provided direct access to system memory for connected devices via a bridge connecting to the front-side bus and eventually to the CPU. PCI 1.0 was released in 1992, PCI 2.0 in 1993, PCI 2.1 in 1995, PCI 2.2 in 1998, PCI 2.3 in 2002, and PCI 3.0 in 2004. PCI became popular when Windows 95 introduced its Plug and Play (PnP) feature in 1995. Intel had incorporated the PnP standard into PCI, which gave it the advantage over ISA. PCI didn't require jumpers or dip switches like ISA did. PCIe improved on PCI and has a higher maximum system bus throughput, a lower I/O pin count, and is smaller physically. It was developed by Intel and the Arapaho Work Group (AWG). It became the primary motherboard-level interconnect for PCs by 2012 and replaced Accelerated Graphics Port (AGP) as the default interface for graphics cards for new systems. PCI-X is a similar technology to PCI. Standing for Peripheral Component Interconnect eXtended, PCI-X improves bandwidth on the 32-bit PCI bus for servers and workstations. What's a Sound Card & How Do You Fix a 'No Sound' Problem? What Is Accelerated Graphics Port (AGP)? Do You Actually Know What Your PC's Motherboard Does? What Is an Expansion Slot? What Is a Peripheral Device? What Does the Inside of Your PC Look Like? Modern Tech Exists Because of Platforms, But What Are They Really? What are AMIBIOS Beep Codes and What Do They Mean?